The Test & Measurement Tool enables you to configure and control resources, such as instruments, serial devices, drivers, and interfaces, through Instrument Control Toolbox™ without having to write a MATLAB® script. Detect available hardware and drivers. Connect to an instrument or device. Configure instrument or device settings. Automatically generate the MATLAB script. Export acquired data to the MATLAB workspace. 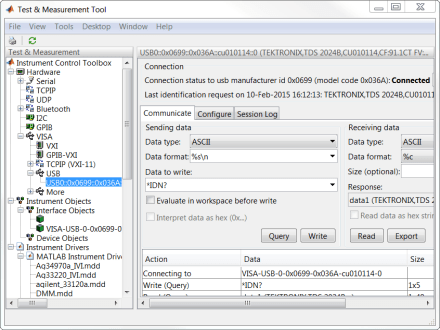 MATLAB Toolstrip: On the Apps tab, under Test and Measurement, click the app icon. MATLAB command prompt: Enter tmtool. tmtool opens the Test & Measurement Tool, which enables you to configure and control resources, such as instruments, serial devices, drivers, and interfaces, accessible through the Instrument Control Toolbox.